The passenger compartment remained stable in the frontal offset test. Dummy readings indicated good protection of the knees and femurs of both the driver and passenger. Suzuki showed that a similar level of protection would be provided to occupants of different sizes and to those sat in different positions. In the full-width rigid barrier impact, protection of the driver was rated as good except for the chest, protection of which was adequate. Dummy readings of chest compression indicated marginal protection for this part of the body but good or adequate protection elsewhere. In the side barrier test, dummy numbers showed good protection but the score for the head was penalised as the side curtain airbag was deemed not to have deployed in the correct manner in the side pole test (see Child Occupant Protection). In the more severe side pole impact, dummy readings of lateral rib compression indicated weak chest protection and the head protection was downgraded to adequate as a result of the incorrect airbag deployment. The front seats and head restraints demonstrated good protection against whiplash in the event of a rear-end collision. A geometric assessment of the rear seats also indicated good protection. The optional 'Radar Brake Support' was not included in this assessment. In the frontal impact, both the 6 and the 10 year dummies were properly restrained and forward movement was not excessive. However, dummy readings revealed high values of neck tensile forces in the 10 year dummy and marginal protection of the neck and chest of the six year dummy. In the side impact, there was insufficient pressure in the side curtain airbag to prevent the head of the 10 year dummy striking the interior of the car, around the C-pillar. This contact led to very high decelerations and protection was rated as poor. Dummy readings of chest deceleration also indicated poor protection of that part of the body. The side wing of the child restraint used for the six year dummy was found to be broken after the test. High-speed film revealed that the dummy's head was not properly contained during the impact, increasing the likelihood of head contact with parts of the car interior. The front passenger airbag can be disabled to allow a rearward-facing child restrain to be used in that seating position. Clear information is provided to the driver regarding the status of the airbag and the system was rewarded. The bumper provided good protection to pedestrians' legs and the bonnet gave predominantly good or adequate results, with poor protection only on the stiff windscreen pillars. The protection provided to the pelvis region was mixed, with areas of good and poor protection. 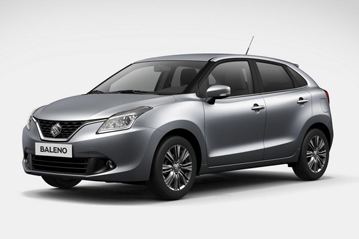 An autonomous braking system capable of detecting pedestrians is not available on the Baleno. The Baleno has a seatbelt reminder system as standard for all seating positions. The optional autonomous braking system was not included in this assessment. A speed assistance system is also an option but is not included in the 'Radar Brake Support' option pack so was not included in this assessment. A lane assistance system is not available for the Baleno. The Suzuki Baleno has two star ratings: one based on the safety equipment which is fitted as standard to all cars in the range and another which also includes an optional safety pack called 'Radar Brake Support'. This assessment is for standard-fit safety equipment only.